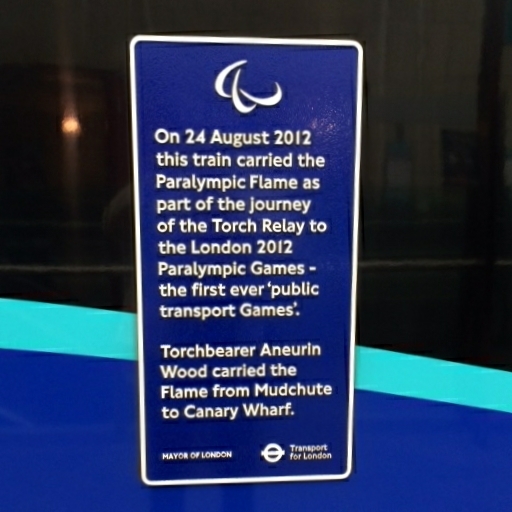 On 24 August 2012 this train carried the Paralympic Flame as part of the journey of the torch relay to the London Paralympic Games - the first ever 'public transport games'. 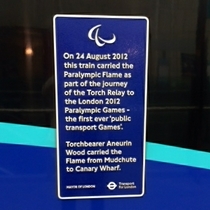 Torchbearer Aneurin Wood carried the flame from Mudchute to Canary Wharf. The plaque is on the side of the train. An unusual memorial in that it has no permanent location, so we have used the place where we first spotted it.